Manaus (Agenzia Fides) - 2019 World Youth Day will bring together young people from all over the world in Panama from 22 to 27 January. Among them are eight young Brazilian natives, representatives of different peoples and regions: the Tupinambá of Bahia, the Tukanos and the Barés of Amazonas, the Guarani-Kaiowa del Mato Grosso do Sul, the Karipuna of Rondonia or the Guarajaras del Maranhão. Speaking to Agenzia Fides, these young people declare they are sent by their different peoples, by their relatives, to meet Pope Francis, who has repeatedly expressed his closeness to the peoples. In the days preceding World Youth Day, during the so-called days in the dioceses, the Brazilian delegation will take part, from 17 to 21 January, in the World Meeting of Indigenous Youth, which will be held in Soloy, diocese of David, where hundreds of young people from different indigenous peoples of the world are expected, in an attempt to reflect and celebrate their faith in Christ according to the millennial wealth of their cultures. The young Brazilians will be accompanied by Sr. Laura Vicuña Pereira Manso, of the missionary indigenist Council (CIMI), a body of the National Conference of Bishops of Brazil that accompanies the lives of the Brazilian indigenous peoples, helping them in the continuous attacks of which they are victims. Some of these threats have been reported to Fides by young indigenous people, highlighting daily situations in their communities and the difficulties currently experienced by many of these peoples, who in their view are a repetition of situations that have already occurred in the last five hundred years. 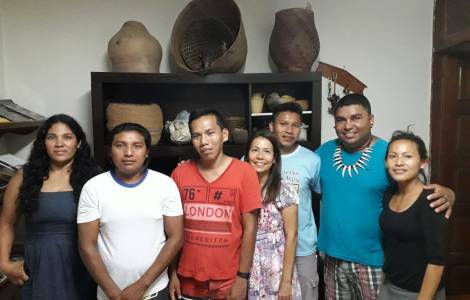 Before their journey, the young indigenous people gathered in the headquarters of the indigenist Council of Manaus, where in addition to getting to know each other, exchanged experiences and saw how to organize how much they will share in the meetings in which they will participate, both with the natives and with all the participants at WYD.